Lumpini park is the most popular park for exercising and visiting- there are loads of people (Thai and foreign) taking part in running, yoga, fan dancing and aerobics each morning and afternoon, good places to sit and bikes are allowed after 10am until around 3pm. It’s a big park and one of my favorite places to run. 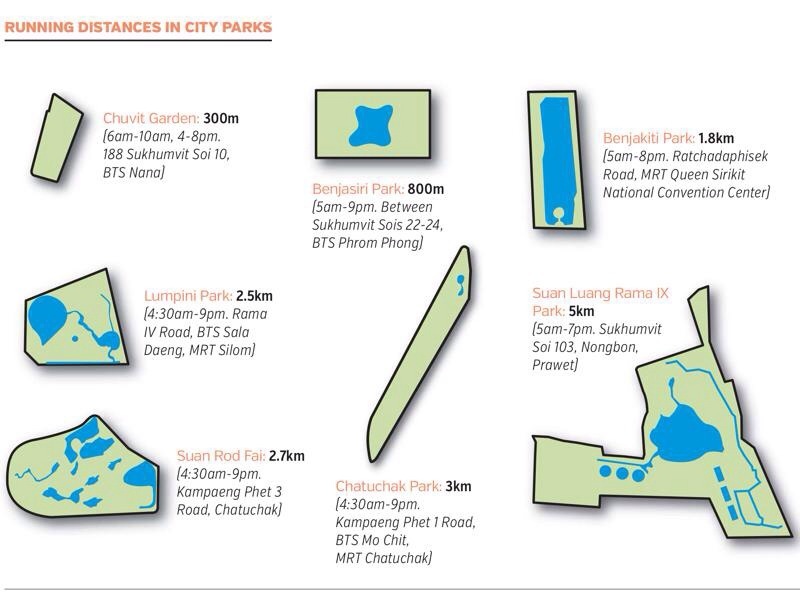 Chatuchak Park has a good running loop, but not nearly the shade of Lumpini as it is bordered by a very busy road. It connects to the weekend market, but really isn’t a very compelling place to hang out and read a book (head to Suan Rod Fai). Chuvit Garden is private and very small, but a nice place to sit in the shade; it’s small- small, I always had a chuckle at the people running in this park and wondered how they didn’t get dizzy. Suan Rod Fai is a nice park- loads of shade and open to cyclists and runners all day. I was told this used to be a golf course, it certainly looks like it as there are wide sections of grass, nice ponds and beautiful old trees. It is very close to the JJ weekend market (and Chatuchak park), so easy to make a day of it. This park is frequented by Thais, it’s a nice place for a run or to thrown down a blanket and have a nap under one of the big trees. Benjakaiti Park has a lake with a running course and cycling lane around it, but very little shade and very little to see, one side of the park is bordered by a very busy road, boredom sets in quickly if you’re running or cycling. This entry was posted in Landmark, Sightseeing and tagged bangkok parks. Bookmark the permalink.